Moonraker is a film of welcome disbelief. Just when you think that James Bond can’t get into a more fantastic situation or that the spectacle can’t get anymore audacious- it does. The film owes only a nod of recognition to Ian Fleming’s third Bond novel, and owes much of its inspiration from the success of 1977’s Star Wars. Interestingly whereas The spy who loved me (which also didn‘t resemble Fleming’s novel) was credited as ‘Ian Fleming’s James Bond 007 in The spy…’ this is credited as “Ian Fleming’s Moonraker”. Despite this literary nod, the film bears very little resemblance to the novel. Because The spy who loved me was seen as a return to form (not least commercially) Cubby Broccoli wanted the best of both worlds- more of what made Spy a success and some of what was making films like Star Wars a success. Although the end of Spy had promised that James Bond would return in For your eyes only, the decision was made to jump on the space sci-fi bandwagon. Moonraker, then, is basically The Spy who loved me in space. If you go with the idea that Spy was essentially trying to top the scale of earlier Bonds like You only live twice, you might think Moonraker could have been taking things too far. It’s all very well making Bond’s adventures as fantastical as possible, but what if there’s little sense of the plausible? What ultimate effect will that have on the series? 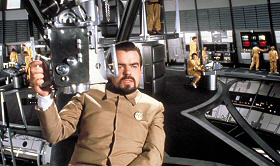 By taking Bond into Outer Space and introducing an astronaut battle with laser weapons, Moonraker comes close to taking the series too far into the ludicrous. Fortunately, it just about gets away with it. Suspicions are growing that Moore never knew a hard day's work. Taking the bear elements of the third Bond novel, Moonraker sees rich industrialist Hugo Drax plotting a plan of genocidal proportions. His chosen few will be taken to a giant space station while the millions left behind are made infertile due to the pollen from a certain orchid being showered over the Earth. Utterly ridiculous, but its Bond’s adventures that lead up to his showdown in space that make it worthwhile, taking in such glamorous locations as Rio and Venice. The cast are also good with Michael Lonsdale putting in a deliciously evil performance as Drax. He gets some wonderful lines, such as “Take care of Mr. Bond, make sure some harm comes to him” and “Mr. Bond, you appear with all the inevitability of an unloved season”. Roger gets some great lines too. “Heartbroken, Mr. Drax,” says Bond as he shoots him with a poison dart, before opening the airlock for him. “Where’s Drax?” asks Bond girl Holly Goodhead. “He had to fly”, explains Bond. Lois Chiles is CIA agent Goodhead, and is a little more action orientated than most Bond girls as well as having some intelligence. There is also the welcome return of Richard Kiel as steel toothed henchman Jaws. “Do you know him?” asks Goodhead. “Not socially”, explains Bond, “His name’s Jaws. He kills people”. What great lines! Sadly, Moonraker also features the final performance of Bernard Lee as ‘M’, who gives a great droll performance as usual. Bernard had been with the series since it started with Dr. No. He passed away in 1981, and is much missed. As a kid in the late '70s and early '80s, if you didn't have a toy Lotus Espirit, you probably had a toy of one of these. Bernard’s final look of disbelief at Bond’s unwitting broadcast message is classic ‘M’. “007!” he says in shock, as Roger gets to grips with Holly Goodhead in zero gravity. “I think Bond is attempting re-entry!”, exclaims Q, who has his back turned to the spectacle. Oh, how we still laugh. The film is as innuendo ridden as your average “Carry on” film, but it still makes me chuckle. John Barry’s music returns as well, giving Moonraker that aural touch of class that was missing from The spy who loved me. There’s also the return of “007”, Bond’s ‘second theme’ a sweeping orchestral canvas on which the screen action gets painted. It got its first airing in From Russia with love and was a staple of the Connery years, and hadn’t been used since Diamonds are forever. In Moonraker it is heard in a Bond film for the last time to date, and it’s as good as ever. Hugo Drax- uses the same tailor as Blofeld by the looks of it. Elsewhere the stunt work (especially in the boat chase) is astounding. Also the miniature effects work and the FX in the space scenes are really impressive. The time and talent that went into them is exceptional. Of course, it is in all the Bond pictures, but it’s especially evident here. Look at those space shuttle launches for one thing. In the days before computer generated effects, what is achieved here is remarkable. They look like genuine shuttle launches. Compare them to the unconvincing rocket launch in You only live twice, for example and you know they’re something special. Derek Meddings received an Oscar nomination for his effects work. Ken Adams' production design. In an ideal world, Manchester Arndale Centre would look like this. There obviously isn’t space to praise all the people involved, but they all deserve credit. Moonraker may be hokum, but it looks fantastic. One other man who should be mentioned is the production genius that is Ken Adam. 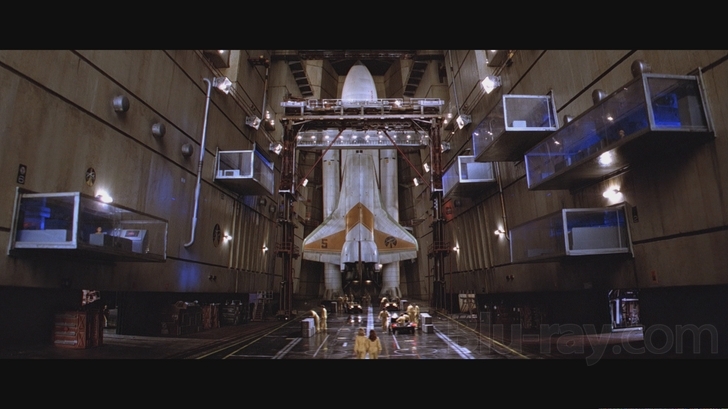 Moonraker was his last Bond film, and his vast cavernous sets suit an epic like this. Peter Lamont would carry on his legacy, and became the ‘official’ Bond designer, right up until his retirement following Casino Royale in 2006. Ken will probably never return to Bond, but as with John Barry he has left a blueprint for future artists. Moonraker was the end of an era in some ways. Eon would never do a Bond quite as epic as this again. The Pierce Brosnan outings have come close, but the series tends to avoid the blatantly fantastic these days. Die another day was fairly over the top, but it lends the character some grounding in reality (or at least pretends to). Moonraker is a fun rollercoaster with no intention to dwell too much on genuine espionage practice. The film looks like the final visual evidence of what started with Goldfinger, and this makes sense when you consider Ken Adam’s involvement in both pictures. They are what we think Bond films look like. Yep, why not add an audacious laser gun battle. In space! Kitchen sink seen floating in the background. 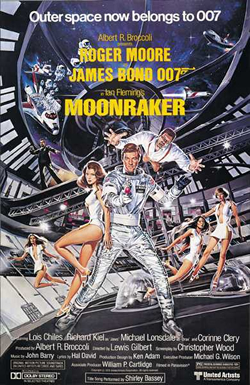 Moonraker is in the final analysis, a stylish piece of action adventure on a grand scale. Filmed in 4 studios, 7 countries, 3 continents and costing more than the first 6 Bond films put together- Moonraker is a big film. It was also the highest grossing Bond picture (unless you adjust for inflation) until Goldeneye, 16 years later. I suppose Moonraker really is the film that Thunderball boasted of being in 1965. 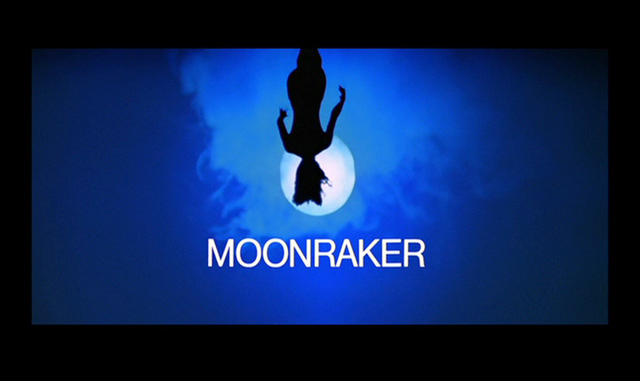 We could argue that Thunderball is a far better film (for all sorts of reasons), but Moonraker is still an impressive spectacle, and it’s always fun to watch.